By Robert “Big Moe” Elmore: Manny Pacquiao’s career has been circumnavigated around several blockades and recently it has found its way to Top Rank Stable Avenue. No stopping at Gary Shaw’s Place, or Don King Avenue, or Main Events Road. Nope. For several fights now, Pacquaio has avoided the main roads called “Fighters with footwork; Slick Boxer; Movement, Fast, Smart, Great Counter Puncher and has take the easier streets. Streets like Weight Drained, Come Straight Ahead, No Head or Lateral Movement. And my personal favorite, Cover Up All Night. When Mosley walked into Wild Card gym fresh off a win over Margarito, twice he given bus tickets and told to get lost. In 2004, Pacquaio journeyed down Juan Manuel Marquez Parkway. The highway proved bumpy with Marquez solving the riddle of Manny’s straight left while countering Pacquiao. The bout was a draw. Later in 2005, Pac rode on another dangerous highway; Erik Morales. Pacquiao was completely out boxed and exposed even more. The immediate rematch offer by Morales was ignored opting to let Morales get his body jack hammered by Zahir Raheem and then Pac decided to fight him. Soon after the public filled the streets to see the Pac mobile cruise past a weight drained Oscar De La Hoya, a threatened to be stripped of his title if he didn’t fight at the 145 catch weight Miguel Cotto, Joshua “cover up” Clottey, and an unapologetic Antonio Margarito. But on May 7th, Manny’s uneventful trip down Shop Worn Avenue to see Shane Mosley has now forced him to go down one of the most dangerous highways in boxing; Floyd Mayweather Drive. Like it or not, Floyd is most diversified fighter in the game. He has driven down many a highway and left them in ruins. For example, the road down Judah Junction had Floyd caught in a traffic jam for 3 or 4 rounds. But ignored the “reduced speed ahead” sign and stepped on the gas after the 4th round leaving Judah in the dust. Hatton’s style was supposed to shut Floyd down. 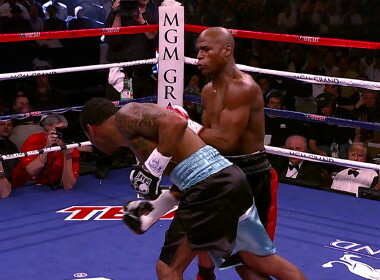 Again, Mayweather made adjustments, wore his man down, and by the 7th round, Hatton’s punches had no snap on them. The Golden Boys yellow brick was supposed to trample Floyd and Oscar did everything in his power to get the upper hand. They got the smaller ring (that was supposed to limit Floyd’s footwork) It didn’t. Floyd was given 10 ounce heavyweight gloves (this was supposed to make his arms heavy and slow down his hand speed) It didn’t and compu box will tell this. Many thought the journey down Mosley’s Manor would be his most difficult challenge. Okay, so Shane scratched Mayweather’s ride a little bit. But by the end of the night, Shane’s pavement was wrecked and pot where every where. FT: People look at Pac’s 52 wins and marvel and take no time at all to look at the opponents. Then look at Mayweather’s 41 wins and automatically discount him. I would take 41 wins knowing they were against different fighters with different styles, then 52 of the same type fighting style. Manny is not learning anything. Now the logical senses is going to be Mayweather waited till Pac lost a step or two then fight him. He could have taken some time off to heal his body, but chooses to fight. He hasn’t lost a step. HIS CHOICE of opponent wasn’t good, he was booed and now he’s simply trying to save face. If you noticed, the Pac has made an excuse was the Morales fight and his fight with Shane (if I missed one correct me). Now the tables have turned. People analysts are calling for Pac’s head a little bit more than Mayweathers. Pac can’t go down Bradley’s Broadway, or stop at Berto’s Place. It’s Mayweather Drive or bust for Pac.